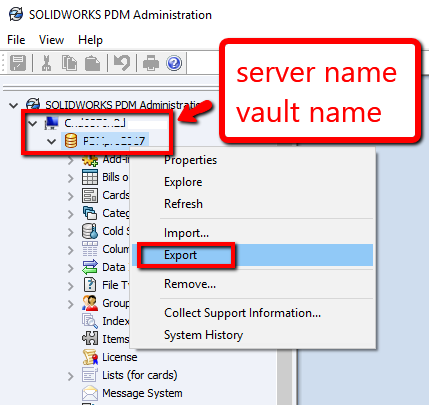 To create a new vault requires the necessary credentials for SQL and for the PDM server(s). Collect these prior to moving onto the next step. On the ‘Select vault root’ in most cases the default selection is fine. When presented with the ‘Choose database’ screen, please choose or type in the Database Server that was collected back in step 2. I recommend not changing the database name. Set the data format that was collected back in step 2 to be the same on this new test vault. On the ‘create the admin user’ screen I recommend unchecking ‘using server default’ and typing a different ‘admin’ password. 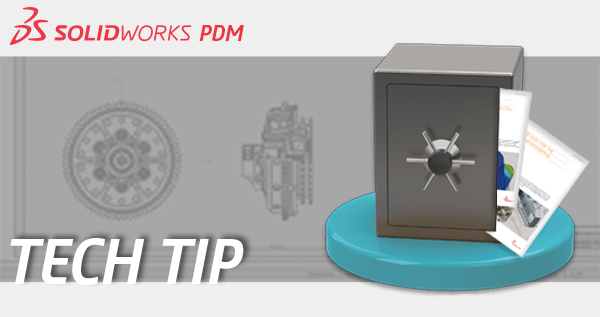 This way users that may have the ‘admin’ password for the production vault don’t accidentally go into the wrong vault. Be sure to write this down or share with only the users that will be testing in the new vault. ‘Configure vault’ screen we will set the ‘Use a predefined configuration’ to ‘Empty”. We will go into why we did this a little later. Click Finish for the test vault be created. Create a vault view. This can be done by either logging into the vault in the ‘Administration’ program or using the ‘View setup’ program. Now we can import the .cex setting file that was created back in step 1. 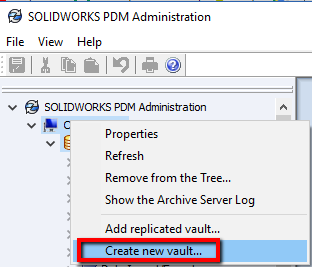 The reason that we selected empty in step 4-h. and then created the vault view in step 5 is so that when we import the .cex settings file, it brings along the data cards and even possibly files that are part of PDM template(s). There are 2 ways of importing setting files into a new vault. The first is to right click over the vault name in the ‘Administrator’ program, select import. The second method is file, open, then when the settings file window is open, drag and drop the top of the tree in the settings window to the new test vault that was created. At this point you can now start doing your testing without effecting the production vault. Make a copy of a project assembly to your desktop and then copy it into the new vault for testing, if needed. Some permissions may need a backup in the copied testing vault. Note: If Dispatch scripts are used in the production vault and are needed for testing, they will need to be exported separately. To check to see if the production vault is using any dispatch scripts: Open the ‘Administration’ program, log into the production vault, expand, Add-ins, right click over Dispatch, select ‘Administrative Actions’. If the ‘Administrative Actions’ is empty or Dispatch isn’t listed, then you don’t have any Dispatch scripts.